Office 2007 Ribbon: A step backwards in keyboard usability? I've had a few more chances to play with Office 2007 since installing it from MSDN a couple of weeks ago. Although I'm still getting used to it, I like the mouse UI that the new Ribbon interface presents. What I'm having a lot more trouble working with is the keyboard interface. I'll confine my comments here to Word 2007, which aside from Outlook (which doesn't use the Ribbon in its main window) is the Office 2007 app I've had the chance to use most so far. I'm a big fan of using keyboard shortcuts to execute frequently-used commands in applications, so in my work with Word 2007 so far, I've tried to continue and use the keyboard shortcuts that I'm familiar with from Word 2003. However, although Office 2007 is advertised to support Office 2003 keyboard accelerator sequences, I have run across a couple of instances already where the Word 2003 keyboard accelerators are altered or broken in Word 2007. Office 2007 also doesn't provide any "forward breadcrumbing" for Office 2003 keyboard accelerator sequences. For example, if I want to do the Office 2003 command "Table | Insert | Row Above", and I know that the 2003 accelerator sequence starts with Alt+a (Table), I (Insert), but then I'm not sure which letter of "Row Above" is the final step of the sequence ("r"? "a"? something else?) then I'm out of luck in Office 2007; Office 2007 shows the keystrokes of the sequence I've typed so far, but provides no feedback regarding the available keystrokes to continue the sequence. So today, I tried to start using (and memorizing) the new keyboard accelerators built into Office 2007. 2007 does provide nice "forward breadcrumbing" for its new keyboard accelerators; when the Alt key is first pressed, the available shortcuts corresponding to each visible Ribbon option are displayed, and new available options continue to be displayed as you progress through the keystroke sequence. Most 2003 sequences corresponded fairly well to the command you were executing, making them easy to remember. (Alt+e, f for Edit | Find, for example.) Even the 2003 sequence for Table | Insert | Row Above (alt+a, i, a) was pretty good when you remember that alt+a was the accelerator for the Table menu (alt+t being used for the Tools menu). The "Insert Table Row Above" is actually not too bad as 2007 accelerator sequences go, either. The 2007 accelerator sequence for the basic "Find" operation is Alt+h, z, n, f, d, f -- 6 keystrokes! And not terribly intuitive, the most questionable sequence being "z, n" to open the "Editing" item on the "Home" ribbon. The Word 2007 Ribbon after pressing Alt+h. "z, n" is the accelerator key sequence for the "Editing" item. Another point about Office 2007 keyboard accelerator sequences is that they will switch the active (visible) section of the Ribbon; so if you were working with the Home section of the Ribbon, and then type the 2007 "Insert Table Row Above" accelerator sequence, the Ribbon switches to make the Layout section visible, and you need to subsequently manually switch the ribbon back to the Home section (either by clicking it with the mouse or with the accelerator sequence alt+h, Esc, Esc) to make the Home icons visible once again. My (early) overall impression is that the Office 2007 Ribbon is a nice step forward in UI design for novice/intermediate users (who will normally be activating commands by using the mouse, as opposed to the keyboard) and for the activation of seldom-used commands, but it is in some ways a step backwards for "power users" who prefer to activate frequently-used commands via the keyboard. I just updated this blog to use a new template. The main reason for the update was to get the content column of the blog (this column) to be variable-width. Thus, if you increase the size of your browser window, the text in this column should rearrange itself to take advantage of all of the available width. Previously, the content column was fixed-width. In addition to not taking advantage of the full available width of large browser windows, the previous template also limited me to posting no wide non-wrapping items (in particular, images and code snippets); if such items were too wide, the template would break (and break rather spectacularly on IE!). I took advantage of Stu's technique to put together this template, which (seems to!) behave properly in both IE 6 and Firefox 2: The right column is always a constant 270px, and the left column resizes dynamically to take advantage of the remaining available width of the browser window, but never shrinks below 400px or the width of the largest non-wrapping item in the column (whichever is greater). Thanks Stu! C# events are typically used when a class instance that needs to notify other class instances that reference it that something has taken place. In some cases, it is useful for an event handler to respond to the event by sending data back to the instance that fired the event. For example, in response to an event fired to give notification that a particular operation is starting, an event handler for the event could respond by returning a boolean value to indicate that the operation should either proceed normally or be aborted. There are a couple of ways in which returning data in response to handling an event in this manner can be set up. One is for the event handler method to set a parameter on one of the event method arguments. The System.ComponentModel.CancelEventArgs class is a good example of this. The CancelEventArgs class has a public Boolean property, Cancel, that the event handler method can set to True to indicate that the operation associated with the fired event should be aborted. A second way for an event handler method to return a value back to the sender is for the delegate that the event is based on to include just that -- a return value. Instead of being declared to return void, the delegate on which the event is based can be defined to return a type such as bool or int. What happens, though, if there is more than one handler for the event, both of which set the return value (either in a property of one of the event method arguments, or in the return value itself)? /// to add a public parameter of type int named Data. /// IntEventArgs as a parameter. Console.Out.WriteLine("[EventSource] Finished firing event. " /// and handles events of type ReturnIntEvent. Console.Out.WriteLine("[Handler (" + this._id + ")] "
This code produces the following output. Note that the final value of the eventArgs.Data parameter (3) matches the value set by the last event handler method to handle the event. [Handler (1)] Handling event, setting data to 1. [Handler (2)] Handling event, setting data to 2. [Handler (3)] Handling event, setting data to 3. At lunch today, I installed the Office 2007 release (obtained through my company's MSDN subscription), replacing my previous Office 2003 installation. Per the online documentation and also a nice Jensen Harris (Microsoft) blog post, Office 2003 menu shortcut keys (e.g. Alt+F, S for File menu | Save) are supposed to work in Office 2007 as well. When I fired up Word 2007 and opened a document, it put me in the "Print Layout" view. I'm accustomed to working in what was called "Normal" view in Word 2003, so I did Alt+V, N to try to switch to Normal view. So far so good after the Alt+V -- Word 2007 even put up a nice little tooltip letting me know I had started typing a Word 2003 shortcut -- but subsequently pressing the N key had no effect. I opened up the new "View" ribbon, and saw in the "Document Views" section that "Normal" was no longer present, but a new "Draft" view was available. I clicked that, and it put me in the equivalent of what "Normal" view was in Word 2003. So "Normal" is apparently renamed to "Draft" in 2007... I switched back to "Print Layout" view (Alt+V, P did work), and then tried Alt+V, D to switch to "Draft" view -- it worked. I fired up Word 2003 on my test machine to verify that Alt+V, D didn't work on that version. I expected it to have no effect... but Alt+V, D actually has a different function in Word 2003: hide/show the Document Map! Consequently, the Alt+V, D shortcut for "hide/show Document Map" in Word 2003 is essentially broken in Word 2007 as well (since it now has a different function than before). I couldn't find any alternative "Alt+V" shortcut in Word 2007 for Document Map, although the "new" Alt+W (View ribbon), V, M shortcut does work for "hide/show Document Map" in Word 2007. I recently had a problem where in Firefox, the Downloads window (the "Download Manager") wouldn't appear when I started to download a file. The Downloads window previously had been working fine. The behavior I saw was that I would begin download of a file (typically something with a .zip extension), but the Downloads window would never appear, and I wouldn't get any notification that the download was in progress or that the download had finished. I did verify that the "Show the Downloads window when downloading a file" checkbox in the Options dialog was checked. Checking and unchecking the checkbox and restarting Firefox didn't do the trick, either. I also tried upgrading from Firefox 1.5 to 2.0, but the problem was still present after the upgrade. A Google search didn't turn up any relevant information. On a suggestion from my brother Jeremy, I got more specific and searched the Mozilla Bugzilla database (the Firefox public bug-tracking system) for the issue, and came up with a similar issue, describing a problem where the Download Manager window did appear, but wouldn't show downloads in progress. Ria Klaassen left a comment on that bug record with a suggestion to try deleting the downloads.rdf file in the Firefox profile folder, as it can sometimes get corrupted and cause problems. I tried deleting my own downloads.rdf file and restarting Firefox, and the fix worked like a charm! My own Download Manager window is working perfectly once again. Thanks Ria! In Firefox 2.0, a new top-level menu, "History," was introduced, with an accelerator keystroke of Alt+S. Unfortunately, this conflicts with the Alt+S keystroke used to access the Google Toolbar for Firefox. In Firefox 2.0, a press of Alt+S activates the History menu instead of setting the focus to the Google Toolbar. Google has indicated (in this Google Groups thread) that a better solution should be forthcoming. Hopefully it won't be too long! Until then, I can live with using the Ctrl+H History sidebar and the back button dropdown menu session history to duplicate most of the History menu's functionality. Update 6/8/2007: The keyboard shortcut Alt+G now works in the latest version of the Google Toolbar for Firefox 2.0 to set the focus to the Google Toolbar's search field. This isn't quite as handy to reach with the left hand on a standard keyboard (compared to Alt+S), but it does bring the Google Toolbar for Firefox into step with the Toolbar for IE, which has always used the Alt+G shortcut to set the focus to the Search field. Open a new IE7 window. Fairly quickly (before the homepage begins loading), paste a valid URL into the address bar and press enter. An error message appears: Caption "Address bar", text "[Url] is currently unavailable." The error doesn't occur if I wait a second or two after the windows opens before navigating to the new URL. This may seem like a fairly contrived set of steps to take, but I wasn't hunting for IE7 bugs when I ran across this; I was just using the browser normally. It's a series of steps I do fairly frequently to quickly bring up a URL in a new IE window via keyboard: copy an URL to the clipboard, open the new IE window (Winkey | down arrow | Enter -- IE is the top item in my Windows XP Start menu), Alt+d to set the focus to the address bar in the new IE7 window, Ctrl+v to paste the URL, enter to navigate to the URL. I have to think this behavior of IE7 is a bug -- at least, it doesn't seem like something that should be classified as "working as intended" or "by design"! And I never saw this behavior in several years of using IE6. I just spent a frustrating few minutes trying to figure out what looked to me like some unexpected behavior in the code (C# 2.0) for a drag/drop operation in a Windows Forms component. In the handler for a DragOver event, I was setting the Effect property of the DragEventArgs argument to DragDropEffects.Link, but then subsequently in my GiveFeedback event handler, the Effect property of the GiveFeedbackEventArgs was coming back as None. See the problem? I didn't, at first. That is, a bitwise OR combination of all of the members of the enum aside from the None member. The Link member is not present! This is why my GiveFeeback event handler was failing to recognize DragDropEffects values of Link -- Link was not actually being specified in the allowedEffects parameter (argument 2) of my DoDragDrop call. This did have the desired effect of getting my GiveFeedback event handler method to support DragDropEffects values of Link. The fact that DragDropEffects.All does not include the value for Link isn't clearly spelled out on the MSDN help page for DragDropEffects. The description for the All member does say "The data is copied, removed from the drag source, and scrolled in the drop target," but you need to be paying pretty close attention to notice that "Link" isn't mentioned, even assuming that you check the help before using the member in the first place! Similarly, the example code given on the help page for DoDragDrop does use DragDropEffects.All | DragDropEffects.Link in its call to DoDragDrop, but the use of the Link member there isn't called out or noted with a comment. Due to its counter-intuitive nature, I would go so far as to call the omission of the DragDropEffects.Link bit from the DragDropEffects.All value non-standard... if the DragDropEffects enum wasn't a part of the standard .Net Framework library! :-) Perhaps there is a good historical (legacy support) reason for the exclusion, but if so, it isn't at all clear from just looking at the documentation. I'll first get right to the main point of this post; the full story behind how I encountered this issue is included at the end. When running the installer for the ATI Rage driver for Windows XP from the ATI site (from archive file wxp-ragexl-5-10-2600-6009.exe, unpacked by default to (C:\ATI\support\wxp-ragexl-5-10-2600-6009\setup.exe), an ATI logo and an InstallShield dialog with a progress meter appears. After the progress meter reaches 100%, the installer application crashed. Clicking the "Debug" button on the crash dialog reported an error in file _ins5176._mp. Setup still crashed when I ran it with my virus scanner and other non-critical background processes temporarily disabled. In the Device Manager dialog, expand the Display Adapters tree item. Under Display Adapters, right-click on the ATI adapter item (this may vary; in my case, "XPERT 98 RXL AGP 2X") and select Properties from the context menu to open the Properties dialog. In Step 1, the wizard asks "Can Windows connect to Windows Update to search for software?" Select the "No, not this time" radio button and click Next. In Step 2 ("What do you want the wizard to do? "), select the "Install from a list or specific location (Advanced)" radio button, click Next. In Step 3 ("Please choose your search and installation options"), select the Browse button. In the Browse For Folder dialog that appears, navigate to C:\ATI\support\wxp-ragexl-5-10-2600-6009\ATIDrive. Click OK. Back on the Hardware Update Wizard dialog, click Next. Proceed from that point to install the ATI drivers and finish the Hardware Update Wizard. The CPU case of my development machine at work had started making a moderate-volume loud humming/buzzing sound, coming from the power supply fan in the back of the case. (Normally the machine runs near-silently.) I opened up the case to see if I could fix the problem. I did manage to get the fan fixed such that it stopped making noise, but when I came into work the next morning and powered on my machine, only one of my two monitors was working. The secondary monitor, which is connected to a cheap older PCI video card (an ATI Rage) that I had added to the machine to get dual monitor support, was not functioning; it just showed a blank screen, and the status light on the monitor showed yellow (sleep/inactive) instead of green (active). The ATI Rage display adapter was missing in both Device Manager and the Settings tab of the Display Properties dialog (where all available monitors are normally shown). I think the cause of the problem was that I must have slightly jostled the PCI video card in its slot when I had the case open to fix the fan problem, such that the card was no longer tightly seated, and the computer could no longer "see" that the card was present. I tried (with the computer powered off, of course) tightly reseating the video card in its slot; no luck, the computer still did see the video card. At this point, I uninstalled the ATI driver, with the intention of updating it with the latest version. However, as it turns out, there was no newer version available (next time I'll check this before I uninstall! ); further, when I tried to reinstall the driver, I encountered the setup.exe crash problem that I detailed at the top of this post, so I couldn't get the ATI driver to reinstall. I then tried moving the card to a different PCI slot (which I have had some luck with in the past with a similar problem with a Soundblaster Live sound card not being detected by the computer in one of my home machines). This did get the card to show up in the Display Adapters section of Device Manager once again, but the card still refused to appear in the Display Properties dialog where multiple monitors are configured. I think the problem now was that the card was now running using the Microsoft-provided driver, which apparently did not include multiple monitor support for this particular model of video card. Using the workaround I found, I did get the manage ATI drivers back in place. Even after a reboot, though, the ATI Rage card still wouldn't show up in Display Properties, and the monitor connected to the card continued to stubbornly refuse to activate or show anything. Finally, I swapped the video card back to its original PCI slot, and everything started working again! It was a relief to get the second monitor back on; having enjoyed the luxury of working with dual monitors at work for a while now, I don't ever want to go back to doing development work on a single-monitor machine. All in all this was not exactly the most productive hour or two that I've ever spent at the office! At least I did manage to find a workaround for that Windows XP ATI Rage display driver setup issue, which hopefully might help others out there experiencing the same issue. My son, Elijah, is now 16 months old. I have reflected once or twice on how I might go about introducing him to computer programming (in a few years, once he's older). I myself first learned to program circa 1983, on an original IBM PC that my dad brought home from work. Like other PCs of the time, this machine did not have a hard disk; if booted with no floppy disk in the A: drive, a BASIC programming environment would come up. I remember writing programs that would do math problems, as well as some simple games, eventually including a Zork-like text-based adventure game. It was a pretty nice "sandbox" environment to be able to experiment and learn in. The programming environment was easy to access (just turn on the machine! ), and since the machine didn't even have a hard drive, and no floppy in the drive, I couldn't do anything to damage any of my dad's data. So when Eli is ready to try out some programming for the first time, I've wondered, given today's much-changed environment from the one in which I learned to code back in the early 80s, how might I go about it? This afternoon, I came across a really nice series of blog posts by David Bau about how he went about first helping his (at the time) 6-year-old son learn to program. David and his son Anthony start out writing just a text-based program, just like I used to do on the old IBM PC (and, as David writes, that he used to do on an old Atari machine). Despite the standard of today's kids' software of having rich visuals and sound, Anthony was pretty excited just to be able to create a text-based "guess the number" game (featuring a vampire!). And once Anthony was ready to want to add some simple graphics and sound to his game, David was able to figure out how to get it done with the help of some brief research via Google and some free libraries. As a programmer and the parent of a young child, I found David's story to be an informative (as well as enjoyable and heartwarming) read. I now have a better idea of how I can go about first helping Eli learn to program when the time comes! In the Visual Studio 2005 Watch window (where values of variables or expressions can be monitored during a debugging session), while editing a value in the Name field (where the variable/expression to be monitored is defined), support for the Ctrl+LeftArrow and Ctrl+RightArrow keyboard shortcuts isn't implemented properly. In text-editing applications, the keyboard shortcuts Ctrl+RightArrow and Ctrl+LeftArrow commonly have the functionality of moving the caret (insertion point) to the beginning of the current word or the end of the next word. In the VS 2005 main code window, there is very good support for these keyboard shortcuts: in an identifier with several parts separated by period characters (such as System.Drawing.Rectangle.Empty), the insertion point is moved to before and after each period character on successive uses of the shortcut, making it easy to quickly navigate to either the beginning or the end of each component of the identifier. The insertion point also stops at other common code "punctuation", such as the [ and ] characters. Interestingly, this behavior appears to be a regression from Visual Studio 2003; in VS 2003, a quick test shows that when doing a Ctrl+LeftArrow / Ctrl+RightArrow in the Watch window, the caret does indeed treat a "." character as a stopping point. Possibly this is a result of a rewrite of the Watch window to implement one of the very nice new features introduced in VS 2005: Intellisense being enabled and usable when editing a value in the Watch window. This morning, I noticed an issue with a particular popup browser window that my development team's browser-based application opens. With the application running in an Internet Explorer instance in the right monitor on my dual-monitor dev system, when the popup window was opened, it appeared in the center of the left monitor. What I wanted to do was supply top and left attribute values based on an offset of the screen position of the parent browser window. However, it wasn't clear to me how to get the parent window position. On a page with frames, self.screenLeft will return the horizontal position of the current frame relative to the screen, whereas self.screenleft will give you the position of the browser window relative to the screen. Interestingly, support for the screenLeft and screenTop properties apparently was first introduced in Internet Explorer 5. (This is why my copy of The Flamingo was no help in finding the solution -- my old copy is only current through IE 4.) This seems to indicate that in IE 4, you could set the position of a window (either initially in the window.open() call, or later via the window.moveTo() method), but there was no way to get the position of the window! In any case, I was able to solve my original problem of the IE popup window appearing in the wrong place by getting the screen coordinates of the parent window using calls to top.screenLeft and top.screenTop, then adding a delta to each of those values and using the adjusted values in the call to window.open(). For "Find Previous", Alt + p, Shift + F3, and Ctrl + Shift + g are supported, which nicely mirror the "Find Next" shortcuts. I like this broad hotkey support for these functions; I think the (arguable) inelegance of the redundant hotkeys is outweighted by the usability benefit of having whichever common Find Next hotkey combination that is intuitive to a particular user be supported. The incremental find feature itself and its benefits have already been covered pretty well by Jeff Atwood -- head over there to read up if you aren't familiar with the feature. I encountered a problem earlier today where when accessing a website set up to use Windows Integrated Authentication on my development machine across the LAN from my copy of Internet Explorer 7 (beta 3) on my test machine, Internet Explorer 7 was unexpectedly prompting me for credentials. I expected my credentials to be provided automatically via Integrated Authentication. At first I thought that this might be an IE7-specific issue, but Googling for variations on "IE7 Integrated Authentication prompt" didn't turn up anything. I then supposed that the issue might be a general Internet Explorer configuration issue, not specific to IE7. A Google search on "ie 'integrated authentication' prompt" turned up as its first hit a useful Microsoft Knowledge Base article, Internet Explorer May Prompt You for a Password. Among other useful information, the article mentions that IE will prompt for credentials if it thinks the site being connected to is an Internet site (a site not located on the local LAN). This prompted me to check on my client machine IE's Tools menu | Internet Options | Security tab. In the Security tab, my web server machine was set as a member of the Trusted Sites zone. I removed the web server machine from Trusted Sites and restarted IE. Somewhat ironically, Integrated Authentication then started working as expected; I could access the website on the server machine without being prompted for credentials. Apparently, at least in this case, IE interpreted the machine being present in the Trusted Sites zone as meaning that the machine was located out on the Internet (not internally on the LAN). On another test machine running Windows 2003 Server that I used as a client to test the Integrated Authentication on my internal web site, I needed to not only remove my server machine from the Trusted Sites zone, but to explicitly add the machine to the Local Intranet zone before Integrated Authentication worked properly. The window Width and Height properties are now displayed in bold, and at the top of the properties list. Removed the display of window X and Y properties (as they were redundant with the Left and Top properties, which are also displayed). 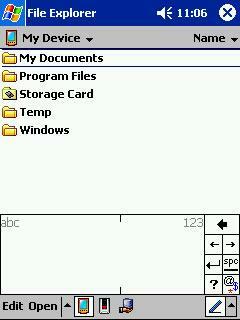 Windows XP themes/styles are now used by the application if they are supported by and enabled in the host operating system. 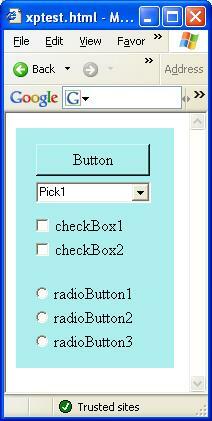 Added a right-click context menu with an "About" dialog. This behavior may be different from previous .NET framework versions; my boss (the team's former technical lead -- a guy who knows his stuff) reported to me that he spent a fair amount of time back when we first migrated to using Windows Forms controls hosted in IE trying to get XP Styles enabled, when we were using the 1.1 .NET framework, without success. This method will have no effect for controls hosted in Internet Explorer. I also found that if the EnableVisualStyles() method is called for any particular control in a given IE window, it affects all controls on the page. (This does make sense, given that the method being called is a member of the Application object, with the application in this case being the IE instance itself.) Even controls which were rendered to the control calling the method are affected -- in the case I tested, a control which was already rendered in the IE window prior to the control calling EnableVisualStyles() repainted itself to use the XP styles, which it wasn't using when it was initially painted. This isn't a major concern since my company's controls will be the only Windows Forms controls in any IE window where they appear, so inadvertently affecting any 3rd-party controls which might be present on the page shouldn't be an issue. (And generally, using the functionality of IE hosting WinForms controls at all seems to be a pretty rare practice!) We will need to be careful to coordinate the change among our own various controls, though, to make sure everything looks right when using the new styles. While working on a simple Windows Forms control to determine how Windows XP styles are supported in Windows Forms 2.0 controls hosted in Internet Explorer -- more on that later -- I found that Internet Explorer 6 doesn't respect public properties of hosted/embedded controls that define a "set" but not a "get". So if a public property of a Windows Forms control hosted in IE isn't being activated as expected, check to make sure that a "get" section has been defined for the property. 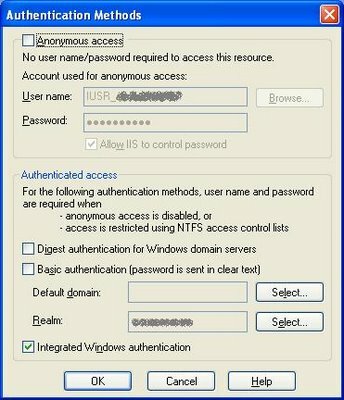 Since only internal employees would be using the site, I decided to set it up to use the Windows Integrated Authentication provided by IIS 5, so users of the site would automatically be logged in using their domain credentials (rather than being prompted for a set of credentials). This worked great when accessing the site in Internet Explorer. However, when using Firefox, I would get prompted by Firefox for a set of credentials when first accessing the site. Entering my domain username and password did allow me to access the site successfully. In the Filter bar that appears, type Network.automatic-ntlm-auth.trusted-uris and press enter. Under "Preference Name", double-click on Network.automatic-ntlm-auth.trusted-uris, and enter the name of the web server machine in the dialog that appears. Now users are able to access the site without being prompted for credentials -- Firefox uses Integrated Authentication and automatically uses the user's domain credentials to log in. Pressing Alt+Space will for most windows activate the "top-left corner menu" for the window. There are a few useful tasks that can be performed from this menu using the keyboard that generally otherwise could only be performed by using the mouse. In a command prompt window, Alt+Space, e, p -- Performs a clipboard paste. This is handy to perform a quick paste at the command prompt without needing to take your hands off the keyboard. (A Paste can also be performed in a command prompt window by right-clicking the window if "QuickEdit Mode" is enabled (in the Properties dialog), or by right-clicking and then selecting Paste from the context menu if QuickEdit is disabled). Alt+Space, n -- Minimizes the current window. Also, Alt+Space, x will maximize the window, and Alt+Space, r will "restore" the window to its original size after it has been maximized. Alt+Space, m -- Puts the current window into "move" mode. In this mode, you can move the position of the current window with the arrow keys. This can be useful for retrieving a window which is completely off the current screen (if you had multiple monitors connected and then disconnected the monitor on which the window was located, for example). I did end up upgrading the router firmware to the latest version (1.52.02). This seems to have resolved the problem with the router's DHCP server where it was never reusing IP addresses (and thus eventually running out), but now the router is just kind of acting kind of flaky; sometimes the PDA will get an IP address and be able to connect to the Internet immediately, sometimes the PDA will get an IP after a long delay (several minutes); and sometimes the PDA will just never get an IP. Since the PDA does occasionally connect successfully, that tells me that the issue is probably not with my security configuration. Further, occasionally if the PDA is connected but then briefly loses contact with the router, it will lose its IP and its connection. This happens even after I've just been using the wireless connection for a short time (so the PDA's lease on the IP address should not yet have expired). At least once, when the PDA has been unable to connect, if I cycle the power on the router (unplug it and then plug it back in), the PDA is then immediately able to connect with no problem. My DVR was also unable to connect to the wireless network for a while yesterday -- I also resolved this by cycling the power on the router. This seems to indicate that the problem is with the router, not with the configuration or hardware of my PDA. I finally decided to throw in the towel and forget about using DHCP with my PDA, and instead just assigned it a static IP address. This seems to be working fine; I haven't had any connectivity issues with the PDA since assigning the static address. Also, I didn't have to enter DNS server information on the PDA to be able to connect to the Internet successfully; just entering the static IP and the gateway (router) IP was sufficient. This is good, since it should keep the hassle of switching between a static IP (when I'm using the PDA at home) and a dynamic IP (when I'm anywhere else) to a minimum. I poked around for a solution on Usenet briefly (searching for "BEFW11S4 DHCP" on Google Groups), and although I saw some posts about people having trouble with this model router and DHCP, I didn't see any good solutions. One person reported exchanging their BEFW11S4 for another copy of the same model, and they didn't have any problems after that, so maybe the DHCP functionality on these models is hit-or-miss. In any event, I'm glad I have a decent workaround for the issue for now. Next time I go shopping for a wireless router, though, I'll probably look at brands other than Linksys. Update 5/15/2006: Unfortunately, my workaround of using a static IP address on the PDA isn't as convenient as I thought. Initially, as noted above, I thought there was no need to enter DNS server information on the PDA; it had appeared that the PDA was picking this information up from the router. However, the PDA is reporting "Site Not Available" errors for any site I hadn't visited recently; appearently, DNS mappings for recently-visited sites were cached on the PDA, so things appeared to be working ok at first as I tested visiting sites that I had visited recently. I may have to keep tinkering with the router to see if I can get the DHCP service to where it "just works". After installing: Do I *really* need to reboot? Oftentimes, after installing some new software application that uses an InstallShield wizard (or similar tool) for its setup, a prompt to reboot the machine appears, stating that the new application can't be used until the reboot is performed. I've asked myself the question: Do I really need to reboot my machine to use the program? I came across a utility that helps answer this question. At least in some cases, the reason that the install program wants to reboot the machine is that a file that it tried to write during the install couldn't be written because it was already in use by another process, so the installer sets up a task to write the file the next time the machine is rebooted (at which time the target file should be unlocked because the process that was locking it before was cleared during the reboot). The PendMoves command-line utility from Sysinternals displays a list of these "pending move" operations. By running pendmoves and looking at the results, you can get more information to help decide whether a reboot is really necessary before running the app. For example, if the only file that is pending write is a help file, it's likely to be safe to run the application even without the latest version of that file installed yet. I'm not sure how well this technique works with Windows updates from Microsoft, but it has worked well for me for standard software application installs. I was looking for a way to expand and collapse Visual Studio .NET regions, and found one today on Visual Studio Hacks; Ctrl+M, Ctrl+M (chord key combination) expands or collapses the current region. This works on both user-defined regions (from #region and #endregion) and on regions that the IDE itself defines, such as class/method XML comments. Another Visual Studio .NET keyboard shortcut/feature (also appearing on the linked Visual Studio Hacks page) which I use a lot is Ctrl+Shift+V. Like the standard Ctrl+V supported by most apps, this does a Clipboard Paste, but if you continue to hold down Ctrl+Shift and press V again, the text that was just pasted is replaced with the next-most-recently Copied text. This feature is known as the Clipboard Ring. I found another bug with Notepad.exe earlier today. When Notepad has word wrap turned off, an entire long (longer than the window width) line of text is selected, and the window is scrolled all the way to the left, then when the Notepad window loses focus, it automatically (and unexpectedly) scrolls all the way to the right. This means you can't have two Notepad windows on the screen, each with a long line of text selected, and each scrolled to the left, at the same time. This is inconvenient when trying to use side-by-side Notepad instances to compare a line of text in two similar files (with the line being compared selected in each window to make that line stand out). While looking at the MSDN documentation page on the CString::Find() method (C++ MFC), I noticed some information that appears to be incorrect. The index of the character in the string to begin the search with, or 0 to start from the beginning. The character at nStart is excluded from the search if nStart is not equal to 0. I tested the behavior of the method in a simple C++ console app using Visual Studio 2005. The character at nStart is indeed always included in the search, even if nStart is nonzero. I reported this issue to Microsoft via their web feedback form, and got a reply that the issue has been forwarded "to the appropriate Microsoft group for review." We'll see if any changes are forthcoming! Bugs in Google Toolbar v2.0 beta for Firefox? The Alt+g keyboard shortcut to focus the search field on the toolbar no longer works. I can see why this was missed during testing because for most Firefox users, Alt+g opens the Go menu. However, in my copy of Firefox, I have the Go menu disabled, which I did for the specific purpose of allowing Alt+g to work with the Google toolbar instead (as it does in the Internet Explorer version of the Google toolbar)! I reported this issue to Google via their contact form for the Toolbar, so hopefully they'll fix it in a future update. It is kind of unfortunate that the Firefox and IE versions of the Toolbar use different keyboard shortcuts; I wonder if IE could be made to use Alt+s as well for consistency. In my previous blog post that I made earlier today after installing the Toolbar update, the post wouldn't publish properly; when I clicked the Publish button, the browser just got stuck in a loop trying to publish the post; the post showed up in my list of posts in the Blogger "control panel", but it didn't actually show up in the blog itself. I ended up opening up IE instead and publishing the post from there, and it worked with no problem. I'm not sure yet whether the Google Toolbar update is somehow to blame for this problem. We'll see how publishing this post goes! Update: Publishing this post from Firefox with the new Google Toolbar installed worked with no problem. Looks like maybe it was just a temporary issue with the Blogger site itself earlier today, as I haven't made any other changes on my machine since then. At first, I thought that caspol just couldn't be used to establish trust to an IP adddress (as opposed to a named server). However, the problem turned out to be that I was using the -name command line option to try give the new code group the same name as the IP address I was establishing trust with -- and this is what the error message was complaining about. So the resolution is to either use a name that doesn't start with a numeric character, or to just leave the -name parameter off the command line entirely (which will result in an unnamed code group). The application that I develop at work runs in a client/server environment where the server is a Windows machine running IIS. I tend to reset the IIS service on the development server reasonably frequently, as it's a quick and easy way to clear any data that has been cached in memory on the server. I used to start and stop the IIS service when necessary by going through Start | Control Panel | Administrative Tools | Services, selecting the IIS Admin service, and clicking the "start", "stop", or "restart" button on the toolbar as necessary. Eventually I decided that going through this multi-step procedure every time was too slow, and went looking for some ways to accomplish the same tasks from the command line. The shortcuts below work with IIS 5, and I believe they also work with IIS 6. This resets the IIS Admin service, including the World Wide Web Publishing service. This resets the IIS Admin service faster. According to the help information (iisreset /? ), iisreset normally might wait up to 20 seconds to wait for a successful stop of internet services before the restart is performed. The timeout:0 parameter causes the reset to be performed immediately. This stops the IIS Admin service and dependent services (including the WWW service) without restarting them. The /y parameter skips the confirmation prompt that would otherwise be displayed. This starts the WWW and IIS Admin services after they were previously stopped. On my Pocket PC, my text entry method of choice is the Block Recognizer -- a clone of the Grafitti text input method from Palm PDA devices. My first PDA was a Palm Pilot (the Pocket PC being my 2nd and current PDA), so I'm on familiar ground entering text with Block Recognizer. I accidentally happened around a workaround for this earlier tonight. I noticed that when in shift mode, the dot that indicates shift mode is active appeares in only the "letters" or "numbers" portion of the input area, but not both. I found that if I want to cancel shift mode in the letters portion of the input area, I can tap in the numbers section -- this moves the "shift" dot from the letters aera to the numbers area -- and then proceed to write normally again in the letters area. This will hopefully work out to be a better solution than my old method of cancelling shift than my old method of writing any stroke, backspacing it, and then continuing, which I found to be really disruptive to my flow of writing when in the middle of a sentence and trying to write quickly (such as when taking notes during a presentation or lecture). Now I just need to figure out my other main problem with Block Recognizer -- my low accuracy rate, particularly when it comes to the software misinterpreting my entry of a standard a-z letter character as an "international" character. The "œ" ("oe") character is one that comes up particularly often. I wish there were a way to disable recognition of all characters except the standard a-z and 0-9 when not in one of the shift modes. In the past, I've run into a problem where when trying to debug a .Net Windows Forms application running embedded in an Internet Explorer window in Visual Studio, breakpoints will not be hit in the debugger. I've seen this issue myself in Visual Studio 2002 and 2003; a colleague just told me that the issue is apparently present in VS 2005 as well. The solution is in the Project Properties dialog/pane, on the Debug tab, instead of checking the "Start browser with URL" radio button, the "Start external program" radio button needs to be checked instead. In the text field for "Start external program", enter c:\program files\internet Explorer\iexplore.exe (or wherever your local copy of iexplore.exe is located). Optionally, you can enter the URL of the web page that you want to be initially loaded in the browser in the "Command line arguments" field. Another thing to verify is that the <object> tab in your web page is pointing to the current debug version of your application's .dll file. Once that is done, you should be able to successfully hit breakpoints when debugging the application running in the browser.